De La Rosa’s fastball sat 93-95 mph in the outing, despite a bitter wind chill that visibly affected the players on the field, most sporting cold weather masks and hoods. He got all five strikeouts on his changeup, which sat 85-87, and he threw his slider at 78-83 mph. He showed the ability to throw all three pitches in any count, and kept them down in the zone, limiting hard contact. As for his control, the final numbers show that De La Rosa threw 43 of 70 pitches for strikes. He did struggle a bit in the second inning on that front, throwing nine of 19 pitches for strikes and falling behind all four batters he faced. However, he threw first-pitch strikes to 12 of the 13 batters he faced outside of that frame, while throwing 34 of 51 pitches for strikes in the first, third, fourth, and fifth. 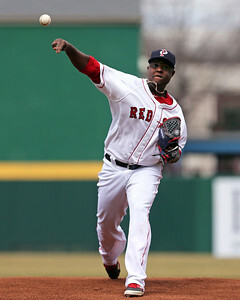 The SoxProspects.com scouting department will have more on the outing later in the week, but one thing was clear: The more outings from De La Rosa like Saturday’s, the more likely we will see him in Boston soon. Much has been written about Garin Cecchini’s undeniable ability at the plate, and he has lived up to the hype at the plate four games into 2014. In his first series as a member of the PawSox, Cecchini went 6 for 12 with a double and three walks, good for a .500/.600/.583 line. But with the universal praise for his offensive game, there have also been questions about his defensive ability at third base. On Saturday, in windy, chilly conditions, Cecchini had ample opportunity in the field to try and answer those questions. 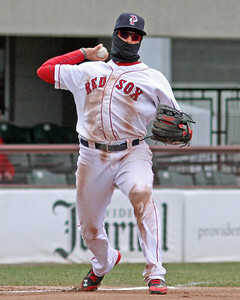 In the fourth, Cecchini made consecutive plays to his left. On the first, he moved several steps to cut off a chopper and make the throw to first. The next batter drove a sharp groundball for which he had to dive, knocking the ball down before getting up to throw the runner out. In the sixth, Cecchini was pulled in the opposite direction, moving to his right to backhand a groundball and making a deep throw from the third-base line (pictured). None of the plays were particularly simple, and certainly nobody would accuse Cecchini of making them look any easier than they were. But he made the plays, a point that both he and Boles noted after the game. Cecchini is certainly willing to put the work in to improve at third. He noted that he had worked with Crabbe before the game on getting more carry on his throws and on slowing things down in the field. After the game, he was one of a couple players who immediately hit the weight room for a workout. One last note: We at SoxProspects.com want to send our congratulations to Paul Kenyon of the Providence Journal, who worked Saturday's game and is retiring after 44 years in the journalism business, 37 with the ProJo. Paul’s colleague, Jim Donaldson, had a wonderful tribute to Paul in Saturday’s edition that I recommend you check out. Photo Credit: Rubby De La Rosa and Garin Cecchini by Kelly O'Connor. Chris Hatfield is Executive Editor of SoxProspects.com. Follow him @SPChrisHatfield.